Many vehicle manufacturers are moving towards a newer battery technology that offers numerous advantages to today’s drivers.This car battery technology, commonly known as AGM (absorbent glass mat), delivers an effective and efficient upgrade to traditional battery design, performance, durability, and lifespan. Depending on the make and model of your vehicle and your performance expectations, an AGM battery may just be the best option for you. Also known as VRLA (valve regulated lead acid) and SLA (seal lead acid), the AGM battery was developed in the 1980s for use in military aircrafts. Original equipment car manufacturers are capitalizing on the design and performance of the AGM battery and utilizing them in many of today’s vehicles. Designed as a long life, durable, reliable, and safer battery solution, these car batteries have proven to be an outstanding upgrade from the traditional flooded lead-acid battery. Manufactured with highly absorbent polyester or fiberglass mat separators, these batteries benefit from the fact that the electrolyte (battery acid) cannot flow freely and is evenly distributed across the active plate surfaces. AGM operates by using recombinant chemistry, in which oxygen recombines through the separators that live between the negative and positive plates. Additionally, and unlike a flooded battery, the plates and separators are held within their cells under compression, resulting in up to 20 times better resistance to vibration. Another AGM advantage is that they discharge much more slowly than a flooded battery when the car is not operated for a period of time. 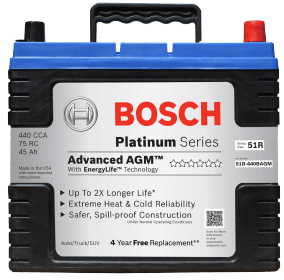 AGM is safer because there is no free electrolyte, AGM batteries eliminate the spill hazard that exists with lead-acid batteries, resulting in an increased level of safety for the user. Known for their enhanced electrical reliability, AGM batteries are ideal for vehicles that are heavily equipped with electronic devices, including navigation, aftermarket car audio systems, electric parking brakes, stop-start technology, and more. Producing an overall higher voltage, AGM batteries can sustain the load that today’s sophisticated electrical systems require. Perhaps the greatest advantage of AGM is product life, lasting up to twice as long as a comparable flooded battery. From a performance perspective, the AGM battery boasts better recharge capability, while providing up to 3 times more starts per cycle and produces more power per cycle. Overall, its construction, design, and cyclability make the AGM battery a longer lasting, more reliable alternative to the traditional lead acid technology. When it comes to your vehicle, it is important to do your research and familiarize yourself with the available options. Whether you are selecting a new seat cover, car battery, or tire, knowing what options are available can help you make the best possible choice. Our Pep Boys professional technicians and store associates are always on hand to answer questions and provide guidance. From information to installation, we have you covered.